lying around here for a few years since the TV itself was having problems but now thinking of using it as pc monitor to watch videos. When I play the music videos the TV audio is playing only on the TV, I wish to mute it and have only audio from the pc's headphone out. These are the connections, any ideas please? Are you saying that you want to use the PC to play videos over HDMI to the TV and have the audio of the video only present on the PC and not on the TV speakers? I'm assuming you're connecting to the TV using HDMI, which supplies both video and audio to the TV (and also adds a new audio output to the PC). What OS are you running on the PC? If it's Windows 10, if you go to the bottom right corner of the task bar and click the little speaker icon, you should get a pop-up allowing you to change the audio output from the TV HDMI output to any other destination of your choice. If it's not Windows 10, the same may work but if not then you should be able to do the same thing from the audio controls in the control panel, (though you may have to have the TV connected first). Eddy Deegan wrote: Are you saying that you want to use the PC to play videos over HDMI to the TV and have the audio of the video only present on the PC and not on the TV speakers? Yes to all of the above, thanks, will try that tomorrow morning and get back to you. The TV has a VGA input for which I have a 50' cable but no video is showing via that input from my win7 desktop and don't know why. Which means I will need to get a 50' HDMI. Or you could just turn the volume on the TV to 'mute'? Sam Spoons wrote: Or you could just turn the volume on the TV to 'mute'? I suspect that will result in no audio at all. HDMI adds a new ephemoral output-only sound interface to Windows and all PC audio gets sent to it. Muting the TV then has the same effect as muting your default interface on th PC as the TV audio circuitry is now where all sound is sent. 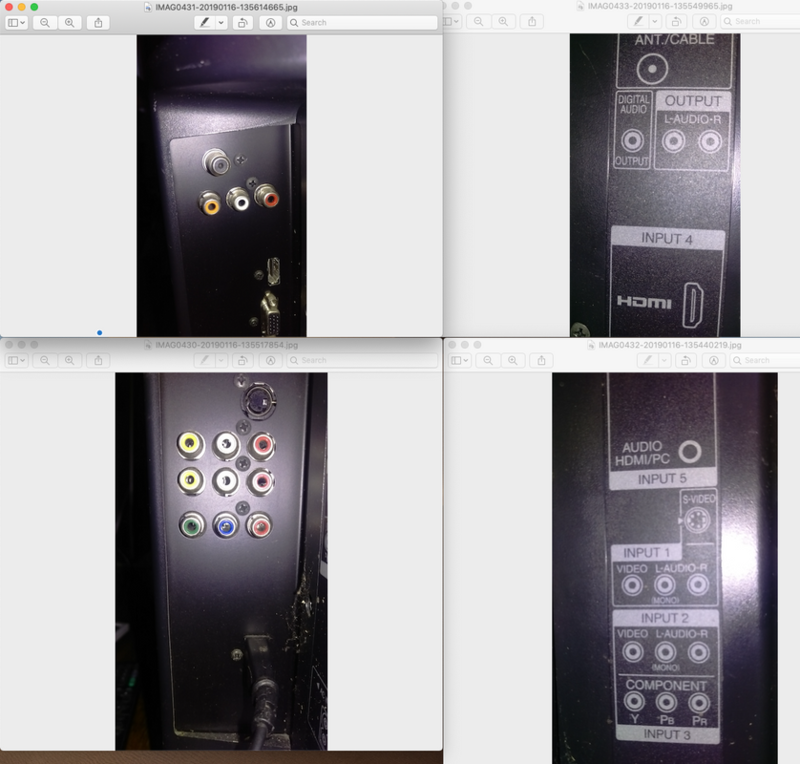 As the interface is ephemoral you need to plug the HDMI cable in first, then select a different output for the audio as I described above. Should work fine! mikehende wrote: Yes to all of the above, thanks, will try that tomorrow morning and get back to you. The TV has a VGA input for which I have a 50' cable but no video is showing via that input from my win7 desktop and don't know why. Which means I will need to get a 50' HDMI. Perhaps you need to set the resolution to 1366 x 768 (quoted in that manual) for the external display. Eddy Deegan wrote: If it's Windows 10, if you go to the bottom right corner of the task bar and click the little speaker icon, you should get a pop-up allowing you to change the audio output from the TV HDMI output to any other destination of your choice. YES, exactly as you've stated, that problem is solved, thanks! Now to figure out why the VGA is not working. that should be the correct connector right? Before ordering wondering if the TV vga connector might have any specific requirements for this? Sorry don;t mean to bump these posts guys but not seeing an "edit" button? I am confused about it mentioning an "RGB" cable since computers use a VGA cable to connect to a monitor? Also, I am not understanding what it means by "converting to external output", does that mean that I might be on the right track converting the VGA to HDMI, is that what this might be referring to please? 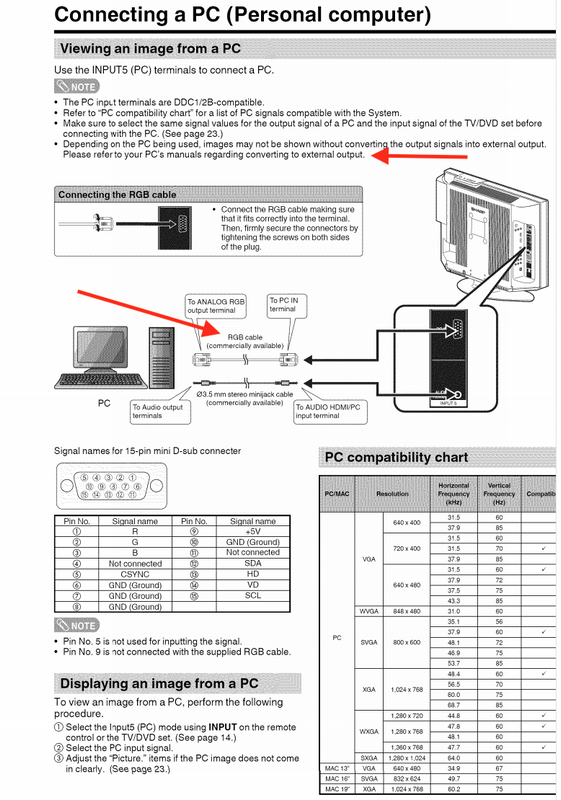 I was simply thinking that since the HDMI input is working on the TV then it might work to convert the VGA connector on the PC to hdmi. For reasons best known to them they have decided to call it an RGB cable when most people would just say VGA. Note that the cable carries analog signals for Red, Green and Blue. Did you select the input on the TV as explained on that page? Did the computer say it could not connect to the external display when you tried it? 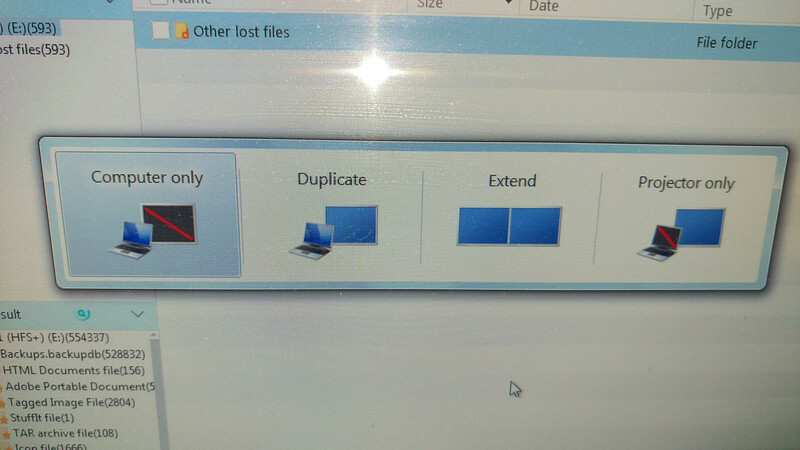 Did you extend, duplicate your screen or try to only use the external one? Note that for older TVs not designed to be monitors the image quality might not be that great. wireman wrote: Did you select the input on the TV as explained on that page? No, there is only one VGA connector on the PC so I ran the VGA cable directly from that to the vga input on the TV. Agreed, this TV is about 10 years old I think. If this is too much trouble I will simply junk it and buy a PC monitor to watch the videos. Sorry, I was thinking you had two connections for some reason with this talk of HDMI + VGA. The problem with the adaptor is that it might not work for whatever reason the direct connection does not work. If you can borrow or have a laptop with a VGA connector that might be worth trying because then you might learn more about where the problem is. Alternatively if you could borrow a monitor/TV to try that is another option. I used to have a small Sharp TV that was not a bad monitor for the price. Hi Mike, a few months ago I was having all sorts of problems with monitors and such but mine were the other way around. I wanted to feed a PC monitors with PAL i from a DVD player. I had 3, rather elderly monitors around but none would work. I bought various adaptors but no joy. Have you got the PC setup for an external screen? Press the Windows key +P and you get the options. You might have to delve into the setup menus to make sure the VGA port is activated. I presently have two TVs fed from computers. My living room TV is a 42" JVC and is fed VGA from a desktop. I sit about 1.5mtrs from the TV and the PC is pin sharp to me. In another room I have a 22 Bush FSTV on VGA from a DTp. I have also used HDMI from this HP I3 laptop. The Bush was £40.00 from the Scope shop. Charity shops are a great source of tellies! I had to get an RC from 'Zon but no biggy. Mostly they have the remotes. Unless you are a gamer, FSTVs should give you all the quality and resolution you need. Tip, try rebooting the telly if it does not immediately show a picture. I hooked a DVD player to my JVC via SCART and no show. Power cycling the TV brought it up. Forgot! 50 feet seems a long run for VGA or HMDI? If you find picture degradation (or just no go!) you can get VGA adaptors that put the video down CAT5 cable and that can run 90mtrs or so. HDMI can also be done but you need two CAT 5s in parallel. CAT cable is very cheap. [quote="ef37a"]Have you got the PC setup for an external screen? Thanks Dave, I will try when I get the chance and get back to you. No I did not, I am not sure this pc has a setup for that or dual monitor, will look into it. ef37a wrote: Have you got the PC setup for an external screen? Press the Windows key +P and you get the options. You might have to delve into the setup menus to make sure the VGA port is activated. Dave. Yes Dave, the setup is set on Computer Only, didn;t expect this pc to have those options but thanks! So would I need to do anything else except for selecting either Extend or Projector only options please? I can only connect the TV tomorrow sometime. So I tried Inputs 4 and 5 and tried the different options selecting "Extend and Duplicate" but no signal. VGA is a fairly old and stable protocol so shouldnt be a problem with old TVs. You need to make sure the PC is transmitting video (as Dave says, Windows + P and extend or duplicate the desktop), and that the TV is expecting video from the VGA input. For the former, can right-click on the desktop and select the display properties to see if two-screens is enabled. The specific setting depend on the laptop but it should be fairly obvious. For the latter, either you know the input number (it may be written near the port) or maybe there's an "auto" function that scans all the input. Keep in mind it's analog tech so the handshake can take a few seconds.